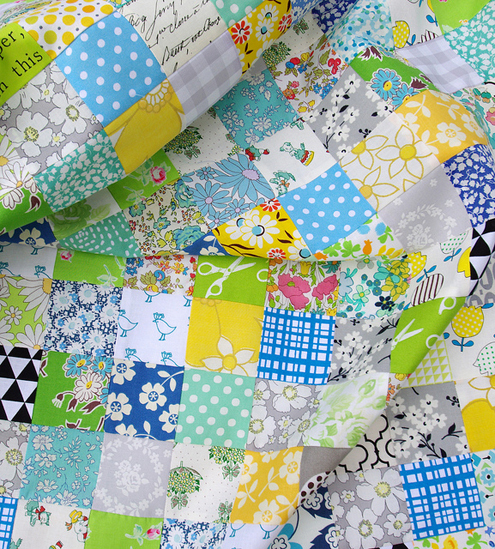 A Spring Quilt! I am so very ready for a change in seasons. As much as I do love Winter (the Australian kind of no-snow Winter) I am ready for more sunshine, longer daylight and outdoor living. We have already had some gorgeous Spring days and I have enjoyed some time outside soaking up the rays ... with a knitting project that has been on the needles since early this year and which now is finished (more of that soon). 400+ patchwork squares each measuring 2 inches x 2 inches. Simple. But it is my favorite way to spend time at the sewing machine. I love that you're just coming into spring while we're slowing working our way into fall here in New England. It's like I can get my little bit of sunshine from your blog even though the days are getting colder here. yay for doing what makes you happy! it's lovely! wonderful! such a fitting description. be well + happy stitching! Your work is sooooo fantastic!! I wish I knew how to make quilts or sew, for that matter!! Yours is the only sewing blog i follow and I truly love it!! I would love to be able to snuggle up with my grandson in a handmade blanket of yours!! You have a wonderful gift and I am very honnored to be able to see your work!! What a blessing!! Thank you for sharing!! Waaah! We are heading towards winter and it may not be the Australian kind - in fact it probably won't be! I am sort of sad! Cheered up by your lovely colours somewhat! Beautiful! 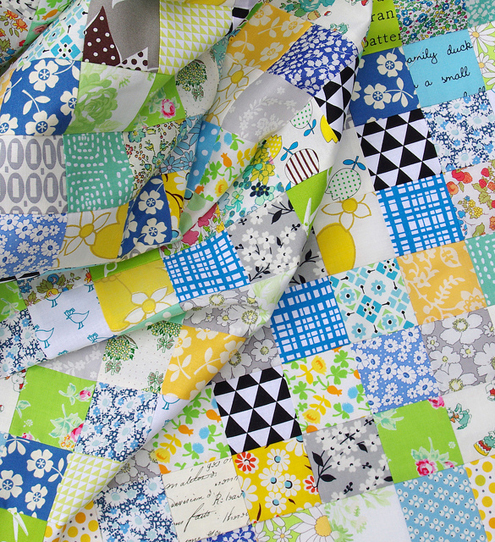 How do you go about your patchwork? Yours always seem to have a lovely balance of prints and layout. 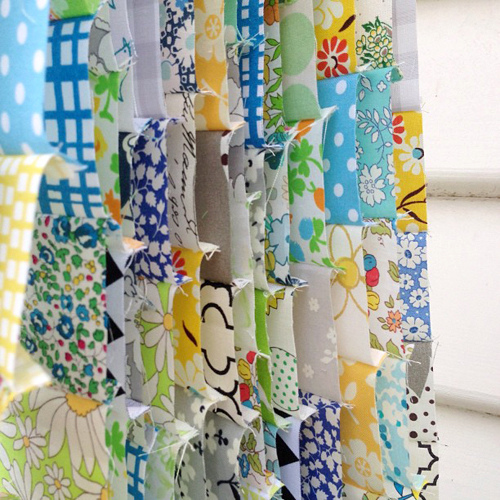 Do you just cut all your squares and randomly sew, or do you have a method to it? Just what I needed. Beautiful! Gorgeous as ever and some of my favourite fabrics in there. This is beautiful. I was looking for quilt fabric the other day and I thought about you. I always love the colors you use so much. I said I should just hire Rita to buy all of my fabric. Just breathtakingly beautiful as always Rita! Although we are coming in our fall here in Canada, I do so love your soothing colours and fabric choices. Oooh, how I would love to purchase a quilt of yours. Just perfeck in my eyes and heart. Thank You for your talent and inspiration. Thank you for your time. That is just gorgeous! You have such skill putting fabrics together. I love to see what you do. It's so beautiful, the fabric selection is perfect for spring. Would you please tell me the name of the two grey flower fabrics -- one has a touch of black, the other a touch of yellow -- they are divine. Love all the blues and greens. You couldn't pick anything better to represent spring, truly gorgeous. I love reading the comments people leave and I imagine these have left you with a warm feeling in your heart. You give so much pleasure to others through your postings, thank you. We in the UK are approaching our autumn season I'm lucky to live on the edge of the Peak District moors surrounded by trees which will give us the most beautiful display with their different shades of autumnal gold. Another great quilt. Those little touches of black are a fun touch. So jealous of your Spring weather as we move into Fall and Winter here in the Northern Hemisphere. LOVE the colors in this one!! You are such an INSPIRATION!!!!!! Hi Rita. Your style is always so refreshing. 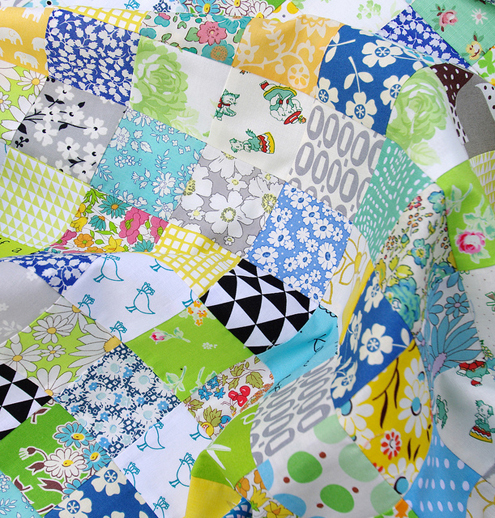 Just curious if you use any kind of die cutter since you make so many quilts from single squares? I love the colours scheme and since we're just beginning autumn here in Poland, it's so nice to see spring colours. And do I spot some Liberty there, too? That's so pretty! I need to get more cheery bright fabric!